The Internet in Cuba: Cuba's 3G mobile access trial -- is the glass half full or half empty? Cuba's 3G mobile access trial -- is the glass half full or half empty? As far as I know, the only notification was this post on the ETECSA Facebook page, but word of the test and instructions for getting online spread by word of mouth. (Note that the service became unavailable for half an hour around 2:30). 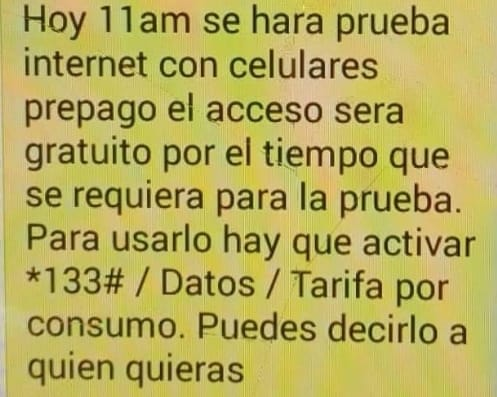 The rapid spread of the news of this unannounced test and the existence of a Cuban hacker culture born of years of keeping old cars and everything else running in spite of poverty and the trade embargo attest to a pent-up demand for connectivity. The news ran like incendiary gunpowder on the Island. 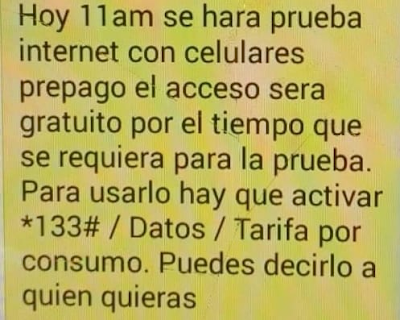 Hundreds of thousands of ETECSA customers trying to get access to IMO, to Facebook to Google while walking down Calle 23, the Malecón or from P2. However, he went on to describe slow (.5 Mbps) unreliable service. The signs are not promising. Tourists and some officials and journalists have had 3G Internet access for some time, but the speed and reliability have been underwhelming. Now ETECSA says they will provide nationwide service to anyone with a compatible phone by the end of the year. Have they the capacity to handle the volume? They say the service will be available "nationwide," but mobile coverage is not available throughout the nation. As of June 1, 2018, there were over 1,400 cellular base stations and over 520 of them were 3G compatible. For example, there are only 19 3G base stations in Las Tunas and 10 of those are in the capital. Upgrading a base station from 2 to 3G requires both new equipment and a faster link between the base station and the Internet -- a large investment will be needed to upgrade all 1,400 base stations. They say there are over 5 million mobile customers in Cuba, but how many of them have 3G-compatible phones? ETECSA will sell a lot of new phones when 3G service becomes available. Okay -- enough with the half-empty news. Let's assume that ETECSA eventually installs the infrastructure to provide 3G mobile connectivity at an affordable price in the most populated areas in Cuba and they have the capacity to meet the 1-3 Mbps speed alluded to on their Web site. Would that constitute a half-full glass? Not really. Mobile connectivity at speeds of 1-3 Mbps is obsolete -- too slow for today's modern Web sites, which are designed with faster speeds in mind. The speed mismatch is exacerbated by the relatively low speed of the phones that are affordable in Cuba. A slow phone with a slow connection is useful for consuming and sharing content, but not for creating it. I've discussed the possibility of differential pricing and government policy encouraging Cubans to use their national intranet rather than the global Internet in previous posts and that plus the inability to run modern Web applications will encourage the formation of a Cuban walled garden. Before he became Cuba's president, Miguel Díaz-Canel hinted at a walled garden strategy when he addressed the Parliament saying "We need to be able to put the content of the revolution online," adding that Cubans could thus "counter the avalanche of pseudo-cultural, banal and vulgar content." I can't argue about banal and vulgar content (and worse), but the cure of a walled garden in a nation with a government-monopoly Internet service provider is worse than the disease. I'm willing to credit the forthcoming 3G rollout as a half-full glass if the Cubans regard it as a temporary stopgap while they plan for a truly modern Internet with the goal of providing affordable, next-generation connectivity to the Global Internet. I'd call it 3/4-full if they'd commit to making 3G mobile connectivity free in the long run. Would you like to publish a guest post on this blog? ¿Le gustaria publicar una contribución a este blog? Which side am I on? Article on the state of the Internet in Cuba, October 1998. Granma says IT is now a priority -- is this true change?